The Bay Area UASI offers staff support to utilize Bay Area planning toolkits and templates to assist Bay Area emergency management and public safety officials. The UASI Technical Assistance Program builds an understanding of current and previously developed UASI products providing stakeholders an easy way to initiate and complete important initiatives to accomplish jurisdictional goals. UASI Project Managers and partners will come to your jurisdiction and review the template/tool with you and your team. As part of this consultation, the UASI Management Team will help you understand how best to use the template/tool, and assist you in identifying a path forward. Working closely with a local point of contact, Project Managers will help you design, conduct, and follow up on a local workshop or tabletop exercise that explores or implements one of the available templates and tools. An UASI Management Team Project Manager can provide day-of exercise support for local tabletop, functional, and full-scale exercises, including controller/evaluator services. A local jurisdiction can request other consultative services from the UASI Management Team, provided it is closely related to one or more of the available templates and tools. The Northern California Regional Intelligence Center (NCRIC) cyber threat intelligence analysts, information technology teams and all levels of law enforcement work together to address cyber security threats. The Bay Area Joint Information System (JIS) is a network of individuals with emergency public information and warning responsibilities throughout the Bay Area. Guiding the Bay Area JIS is a Framework and Toolkit available for any jurisdiction to modify for use locally. A series of online videos is available for individuals to view and learn how to function within and benefit from being part of the Bay Area JIS. The Care and Shelter Planning Toolkit assists local jurisdictions with evaluating capabilities to conduct emergency care and shelter operations. The toolkit includes a Local Government Care and Shelter Gap Identification Tool which enables jurisdictions to organize available resources and forecast needs based on customizable scenarios. The toolkit also includes regional capability building workshop summary reports and shared best practices for planning care and shelter operations. This COOP Plan Template is designed for use by local jurisdictions to prepare a comprehensive Continuity of Operations (COOP) Plan based on the ten essential elements defined by Cal OES and FEMA. It is accompanied by a COOP Planning Handbook, which offers procedural and operational guidance for the preparation and implementation of a COOP Plan. These tools integrate Continuity of Government (COG) planning components. The NCRIC provides regional analytical and investigative support to local, state and federal law enforcement agencies involving terrorism, cybersecurity, information sharing, risk management and infrastructure protection. The Commodity Points of Distribution (C-POD) toolkit assists local jurisdictions in identifying C-POD sites and understanding commodity, equipment, security and staffing needs. The toolkit includes workshop templates, a template C-POD Activation Guide, guidance on establishing emergency C-POD contracts, job action sheets, neccessary forms, and more. This product provides assistance in planning for waivers--adjustments and temporary set-asides--to existing permits and regulations that may inhibit or detrimentally affect disaster response and recovery operations. The toolkit provides the emergency manager with overall concepts, background information, processes and templates helpful in planning and preparing to request permit and regulation waivers. The Just-in-Time EOC training series are based in a Bay Area catastrophic earthquake. Seven separate training videos focus on different topics including Care and Shelter, Evacuation and Transportation, Volunteer Management and Debris Removal. The trainings provide an orientation to a topic, ways to identify key partners and functions, and where to get more information when you need it. They are an excellent tool for someone new to the EOC. The ESF-15 Template establishes a framework for PIOs across a jurisdiction, in the EOC, and at the scene of the incident(s) to collaborate and perform the functions of emergency public information. The 2007/2008 RCPGP projects developed distinct, yet interrelated, plans utilizing the common scenario of a catastrophic earthquake in the Bay Area. Each planning effort produced a regional plan which identified the major roles and responsibilities of regional emergency response entities, as well as the critical relationships and lines of communication between local and regional responders and providers. In addition to the regional plans, local plans are being completed for the twelve counties and three core cities in the Bay Area UASI. These local plans are designed from a standard template to provide consistency and integration with the regional plans, while being customized to the needs of the individual, local jurisdictions. Although developed for a catastrophic earthquake scenario, these plans provide an all-hazards framework designed to be scalable to the size and scope of any disaster. 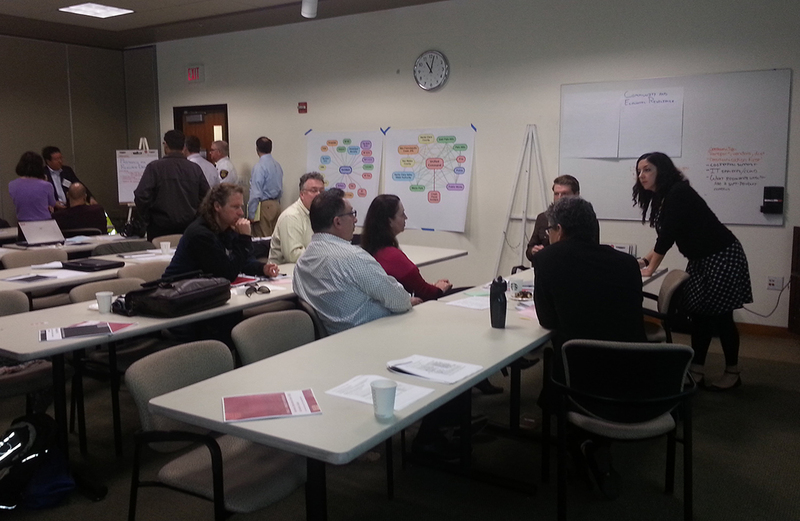 Corinne performs oversight of projects designed to improve the Bay Area’s emergency management operations. She brings national experience in all hazards planning, exercise design, and stakeholder group facilitation. Phil is a retired fire chief carrying 38 years of experience in emergency response, special operations and consequence management. He developed and managed training programs for EMS, fire, law enforcement, emergency management, private industry, military and special operations groups. Amy’s portfolio includes Risk Management, Threat Hazard Identification & Risk Assessment and coordination of the Medical/Public Health Workgroup. Amy joined UASI after 12 years at the San Francisco Division of Emergency Services. Why use the UASI Technical Assistance Program? "The two-day Commodity Points of Distribution (CPOD) course attributed to the success of our 2017 Fleet Week exercise and has helped prepare San Francisco emergency managers for a real world incident." "Being part of the Bay Area JIS allows us to enjoy a sharing of competencies across jurisdictions." "Becoming part of the JIS as a new PIO will give you networking opportunities that you couldn't get any other way." "The Local Government Care and Shelter Gap Identification Tool gives us a way to systematically plan for all shelters within our jurisdiciton. Great Information!!"